An investigation into the science of hearing, child language acquisition, neuroplasticity, brain development, and Deaf culture. A mother notices her toddler is not learning to talk the way his brothers did... Is something wrong? Her search for answers is a journey into the mysteries of the human brain. Lydia Denworth's third son, Alex, was nearly two when he was identified with significant hearing loss that was likely to get worse. Her sweet boy with the big brown eyes had probably never heard her lullabies. Denworth knew the importance of enrichment to the developing brain but had never contemplated the opposite: Deprivation. How would a child's brain grow outside the world of sound most of us take for granted? How would he communicate? Would he learn to read and write-weren't phonics a key to literacy? How long did they have until Alex's brain changed irrevocably? In her drive to understand the choices-starting with the angry debate between supporters of American Sign Language and the controversial but revolutionary cochlear implant-Denworth soon found that every decision carried weighty scientific, social and even political implications. 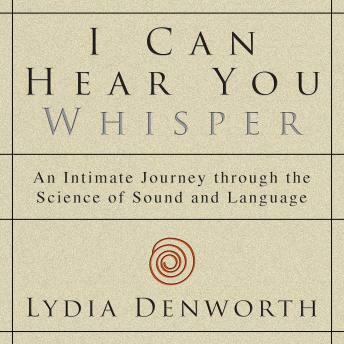 As she grappled with the complex collisions between the emerging field of brain plasticity, the possibilities of modern technology, and the changing culture of the Deaf community, she gained a new appreciation of the exquisite relationship between sound, language and learning. It became clear that Alex's ears-and indeed everyone's-were just the beginning. An acclaimed science journalist as well as a mother, Denworth interviewed the world's experts on language development, inventors of ground-breaking technology, Deaf leaders, and neuroscientists at the frontiers of research. She presents insights from studies of everything from at-risk kids in Head Start to noisy cocktail party conversation, from songbirds to signal processing, and from the invention of the telephone to sign language. Weaving together tales from the centuries-long quest to develop the cochlear implant and simultaneous leaps in neuroscientific knowledge against a tumultuous backdrop of identity politics, I Can Hear You Whisper shows how sound sculpts our children's brains and the life changing consequences of that delicate process.